Natalie McMillan (Schilling) is the “rich girl” in her small town, and Zach Taylor (Thomsen) is the poor local mechanic. Before this West Side Story/Romeo & Juliet-like romance can get off the ground, their buddy Brad Deville (Fralick), who appears to be a cross between a lunkhead and a meathead, drives drunk and they all die (?) - but before “The Man” (Estevez) can collect their souls, they realize what’s going on and they all run away from The Man and his partner (again a ? ), Angel of Death (Z’Dar). This race between life and death intensifies because Natalie reminds The Man of a woman he used to love in a past life. Who will win - those who collect the souls of the recently deceased, or mulleted, 37 year old teens on the run? The second half of the movie is boring, dull, and repetitive. Even the powerhouse team of Z’Dar with his unintelligible electronically-lowered voice and Joe Estevez with his black guyliner can’t remedy that. Their characters are supposed to be menacing because of these things, not to mention their black coats. They also disappear and reappear quickly thanks to what can only be described as “Blip-cuts”. There’s also a green special effect that will remind you not of Slimer from Ghostbusters, but of his Hi-C Ecto-Cooler. Zach Thomsen gives Billy Warlock a run for his money, and Vivian Schilling, interestingly enough, is credited with screenplay/story on the film. 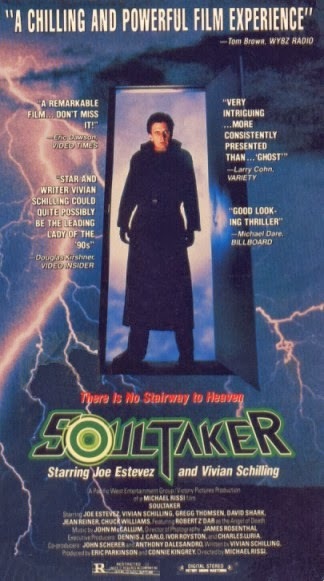 So as a glimpse of the end of the acid-washed 80’s, with plenty of 80’s coolguys and coolgirls and their various fashions, Soultaker has some value for that reason alone. Pounding, generic 80’s rock/metal seems central to their lives, though the end credits song, “Somewhere in Paradise” by Karen Lawrence, would seem to contradict that. Yet again we have a movie of two halves - the first being better, of course - but it’s largely sunk by the dull second half. 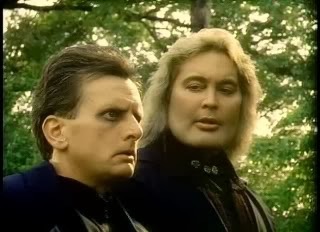 Personally I think some of the films riffed on by MS3TK(which I don't really care for to be honest) were actually decent, like this one, Final Sacrifice, Devil Fish, Future War, Final Justice, Werewolf(1996), Time Chasers, Space Mutiny, City Limits, Pod People, Time Walker, Warrior Of The Lost World, Alien From L.A., Outlaw, Escape 2000, Robot Holocaust, Zombie Nightmare. This film I mainly remember for having songs by 80s rock band "Diamond" who had a pretty good CD, shame they never hit it big. I thought the second half was decent. You're right. Most of those MST3K movies you mentioned are pretty fun. Especially Escape 2000 and The Final Sacrifice. Agree about Diamond too. R.I.P. He will be missed.